So, some of our regular customers are bemoaning the dearth of fish here on the island. Stickman and U-boat were all but skunked on Saturday. Tall Jeff says the beach was “worse than a desert w/o tumbleweeds.” A.Link reported 2 blues trolling in 7 hours. However, as the following reports and pictures will attest, some folks are having a great Fall Run. While most of you were sleeping this morning figuring Igor has put a damper on your fishing, Peter Timmins and John Noonan hit the beach over in Ipswich. They spent the night, midnight until day break “slinging” eels. Peter brought this nice 32 pounder in this morning. I think John had to go to work. Peter had a good night with about 6 fish being landed and this was the biggest of the night and a season high for him. Peter hit fish until the wind turned at about 3am and left me with this saying: “Wind from the east, fish bite least”. Doug Henderson from North Andover was waiting for me when I opened the store this morning, bought some worms (blood and sea) and headed down to the refuge to see what he could do. The surf that has kicked up from Igor didn’t get in his way. 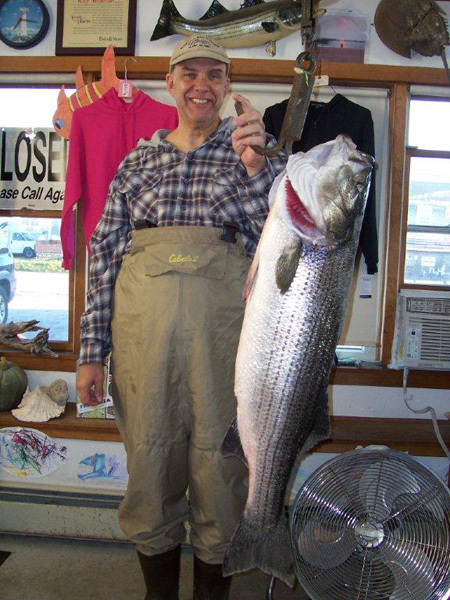 Doug just left the store at noon with this 24.4 pounder(personal best)! He reported that he was using his Surfland Worm Cocktail (put on a seaworm and then wraps a bloodworm around it to help hold it on). Doug ran into a bunch of schoolies before landing his “keeper”. All during the incoming tide he hooked into 14″-27″ fish before catching this one. Doug also stated that he ran into very little weed and only have a few tangles to deal with during this fishing trip. We are the rest of you? Are you going to let a “little” hurricane off the coast get in your way? That means you TallJeff!!!!!!!!!!!!!!!!! Toby??????????????? The tuna trailers have also been shut off. Tom S took a long trip and found birds, but no tuna. A big basking shark seemed to be creating the avian commotion. He did get a peek at a few giants on the topwater, but nothing else and no hookup. MY BAIT MUST NOT BE SMELLY ENOUGH. J/K USING LURES. I’D BETTER SWITCH. In the same boat as Jeff with using lures on Sunday. Out of 20 fisherman on the beach front, I only saw one striper. The waves were awesome though! On another note, last tuesday I found an amazing plug that washed up on lot 3. Brought it into Surfland this Sunday to have a new hook installed on it because the one on there was bent over. Billy greets me and says “did you find that lure? The barb is bent over right? There was a snap swivel too huh? I replied “yes” like I just got my hand caught in the cookie jar. I offered the plug back and Billy and he said “finders, keepers.” I felt that fate brought the plug back to Billy so I left the plug for him. hahaha. This could be a sign for his soon to be record striper! Fish on! Toby, you are a real gentleman and a good honest surf fisherman. I will let you know when he loses another lure. Talljeff on the hand, I’m not sure about. Jury still out on that! Hahaha, that’s halarious! On the other hand about the little hurricane comment, I had to work yesterday so I could not make it to the beach. Otherwise, I’d be throwing that seaworm / blood worm combo! By the way Doug, good job on your recent success in striperville. You’re killin it! That is quite a fish that Peter caught at his SECRET SPOT! 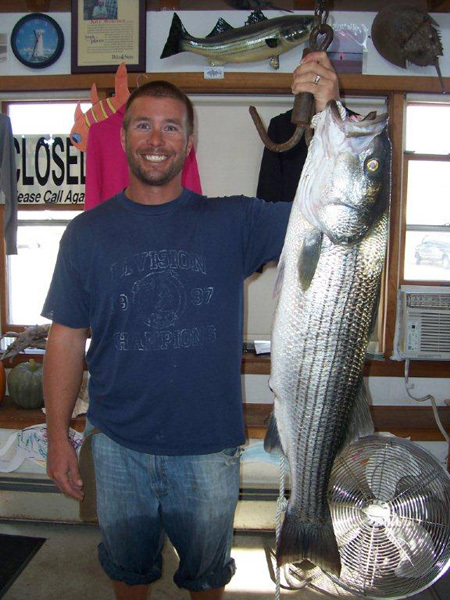 Also, see Brian Moc’s website..click on the local fishing links “link” on this page to go to the site…crane’s beach fishing…he has some comments on keeping stripers and making CHODAH…take a look.